Gunner : Royal Horse Artillery, attd. Regiment : Royal Horse Artillery, attd. Son of James and Mary Alice Nutter, of Clay Cottage, Brierfield, Lancs. His brother, Harry, also died on service and is buried in the adjacent grave. TWO SONS KILLED BY THE SAME SHELL. WELL KNOWN IN BURNLEY EDUCATIONAL CIRCLES. While manning a leading gun, somewhere on the Western Front, a German shell burst close to five members of the Royal Horse Artillery, with the result that all five have succumbed to their wounds. Two of the five were the sons of Mr. and Mrs. James Nutter, of Scarrs Farm, Briercliffe, and the news of the tragic event has caused widespread sorrow and regret, for the family is one of the best known and most highly respected in the district. Gunrs. Harry and Geoffrey Nutter were members of the teaching profession, and both had already achieved such distinctions as presaged careers of exceptional success. The news of their death in action was conveyed to their parents, Mr. and Mrs. Nutter, on Saturday last, in the following communication from Lieut. F. E. Whittaker, dated 7/2/17; - "It is with great regret that I have to inform you that both your sons, Grs. H. and G. Nutter, were mortally wounded yesterday morning. Gunner H. Nutter was alive for a few hours after, but Gunner G. Nutter died within an hour or two. A shell pitched close to five men near a leading gun, and all five have since succumbed to wounds. The terrible tragedy which has befallen you will be hard to bear, and little one can write will help to alleviate your suffering. But there is the knowledge that they died doing their duty nobly. Both were popular with all ranks, and their loss is a severe one to the section. I anticipate you will hear direct from the O.C. the section, but I felt as I must write, as, until the 1st inst., I was the section commander. Any further particulars will be gladly given by the O.C. 52nd section, P.A.H. Battery"
Both brothers enlisted on the same day, namely, January 10th, 1916, and being attached to the same battery in the Royal Horse Artillery, they completed their regimental training together, were home on furlough together last Easter, went out to France together in May last, and have alas, made the supreme sacrifice practically together. Geoffrey had been attached as observer to the Royal Field Artillery, and had been back only a week. Gunner Harry Nutter was 26 years of age, and as a scholar at Briercliffe School, won a county scholarship at the age of 11. He afterwards went to Burnley Higher Grade School for three years, and was the first to win a bursarship in Burnley, but not residing in Burnley borough was debarred payment, but was allowed to attend the Pupil Teachers' Centre. He became a pupil teacher at Briercliffe Council School, and passed his preliminary certificate with five distinctions, being ninth on the list of all the students in the country, taking the examination. He thus won the Freeland prize, which he forfeited, as he did not proceed to college, preferring to take the London Matriculation Examination first. He passed Matriculation, and entered Battersea Training College. Leaving college, after passing the certificate examination with three distinctions, he became assistant master at St. Andrew's School, Burnley. While teaching, he continued his studies, and obtained London Inter. B.Sc. He was studying for his final London B.Sc. when he enlisted. 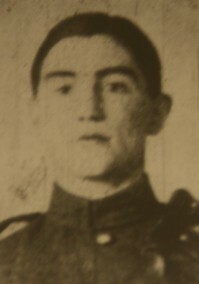 Gunner Geoffrey Nutter was 24 years of age, and was also a scholar at Briercliffe School, from where he proceeded to the Burnley Higher Grade School for two years, and then to the Burnley Grammar School. He passed Oxford Local, and became student teacher at Brierfield Walter-street Council School. He passed the Preliminary Certificate examination, after being two years assistant teacher at Haggate, and proceeded to Borough Road Training College, London. Before his college course finished he enlisted in the R.H.A. with his brother Harry. Gunner Geoffrey Nutter was well known as a sportsman, winning many prizes at the Grammar School sports. As a footballer he was also well known. At Borough Road he became captain of the football team, winning his cap; he was also captain of the Boxing Club, and won the Harriers' race in the Inter College Sports. He was also well-known as a poultry fancier. Two other sons of Mr. and Mrs. Nutter are also in the Army. One of them, Sergt. James H. Nutter, of the R.A.M.C., now wears the Military Medal for conspicuous bravery. The youngest boy, Eric, is a driver in the R.H.A. He has been in Brook War Hospital since before Christmas, with blood poison in his arm through vaccination. He was a student at Burnley High School, learning textile designing. He has won many first and second class certificates for it. He also attended Burnley Grammar School. Sincere and widespread sympathy has been extended to Mr. and Mrs.Nutter and Miss Ball, Gunner Harry's fiancé, in their sad bereavement. SYMPATHY WITH MR. AND MRS. NUTTER. – The Burnley Elementary Education sub Committee have directed that a communication expressing their condolence and sympathy be forwarded to Mr. and Mrs. Nutter, of Scars Farm, Briercliffe, in the bereavement they have sustained in the loss of their two sons, Harry and Geoffrey, both killed in action; also that the committee's congratulations be tendered to Mr. and Mrs. Nutter in respect of the award of the Military Medal to their son James for gallantry.